A superb success for the vintage, the 2006 exhibits a deep ruby/purple hue as well as a poised, classic bouquet of sweet black cherries, graphite, camphor, truffles, and a subtle hint of oak. Medium-bodied with a stunningly layered texture, impressive purity, and beautiful balance, this cuvee is haute couture in a glass. Although surprisingly approachable, it won’t hit its adolescent stage for 8-10 years, and will last for 25-30 years thereafter. Bravo! It is extraordinary to see what the American proprietor, a banker from Buffalo, NY, Robert Wilmers and Veronique Sanders, the granddaughter of the former proprietor, have accomplished at Haut-Bailly. Together they are pushing this outstanding terroir to first-growth quality levels. 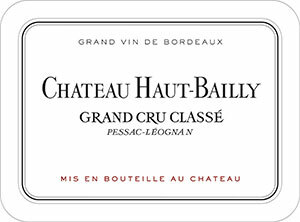 It is an amazing success story, and readers looking for a quintessentially elegant Bordeaux need look no further than Haut-Bailly.